Talent is never enough when trying to carve a path for yourself in any endeavor. The competition for places means that at times, some element of luck is also required to pull through. In Hollywood, the process gets even more brutal when you factor in the relevance of age. Still, a whole lot of people persist; leaving their homes all over the country for California in pursuit of a dream. Luke Perry was one of such people. He persisted, 215 times before he got his first acting job. Now known as the infamous bad boy, Dylan McKay in the teenage TV show, Beverly Hills 90210. He currently stars in another young adult themed show, Riverdale. Continue reading below to learn about the actor. Luke Perry was born Coy Luther Perry III on October 11, 1996. He is the son of Ann Bennett and Coy Luther Perry Jr. Born and raised in Ohio, Luke has deep attachments to the state, especially his hometown, Fredericktown which he still visits regularly for the famed Fredericktown Tomato Show. For his education, he attended the Fredericktown High School, and although he did nothing notable in sports or academics, he was the school mascot, Freddie. After his graduation from Fredericktown, he moved to Los Angeles in pursuit of an acting career. Luke had desired to become an actor and due to the lack of acting opportunities in Ohio, he made the move to the City of Angels. His move to Los Angeles wasn’t a smooth tale as he hoped. He failed to get any acting roles and he had to work as a paver to foot his bills. Between Los Angeles and New York, Luke Perry took part in 215 auditions before he secured his first gig, a TV Commercial. Thankfully for Luke, the luck that secured him his first role wasn’t a one-off and he followed the commercial up with an appearance in a music video, Be Chrool to Your Scuel. The video was made for the band, Twisted Sister. After the music video, he got a more stable job as a character in daytime soap operas, Loving and Another World. By 1989, Luke was already an actor with a couple projects in his resumé, but nothing big and defining had happened yet. That changed for Luke when he was cast as Dylan McKay in the teen drama, Beverly Hills 90210. 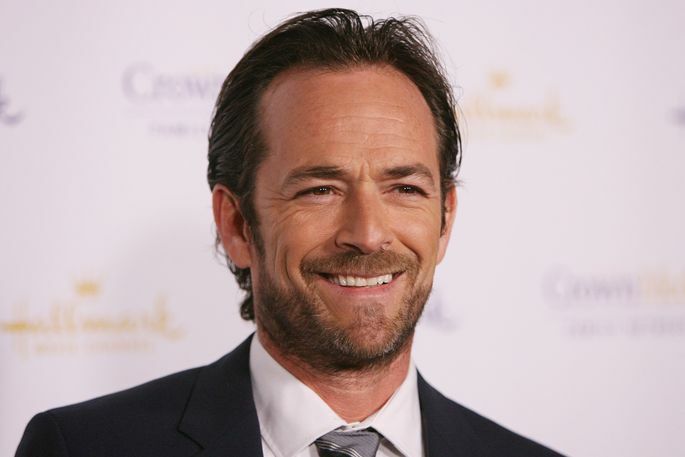 His role as Dylan McKay catapulted him into a teen idol in the 90s and with his new status as a popular actor, Luke secured roles in other projects such as Buffy The Vampire Slayer and 8 Seconds. Luke became wary that his role as Dylan McKay would typecast him forever and might limit the length of his career, and so he sought to leave the Beverly Hills 90210 show and seek out more mature roles. Dylan found some luck securing mature roles, appearing in projects like Normal Life, Invasion and Riot, a film about the 1991 riot based on Rodney King’s story. However, none of his roles in those films helped him secure the transition he wanted from teenage roles to an established adult role. A plethora of financial responsibilities prompted Luke Perry to return to 90210 in 1998 after leaving in 1995. Since Beverly Hills 90210 ended in 2000, Perry has starred in a number of television and film roles. Some of them include the shows Jeremiah, Windfall, John from Cincinnati and a few others. In films, he starred in The Triangle, The Sandlot: Heading Home, A Gunfighter’s Pledge and a couple more others. An actor’s career usually involves a stage performance at least once in their career. Perry’s first stage performance was on Broadway in 2001 for the play, The Rocky Horror Show. He has starred in other stage productions since then. He currently stars in the CW hit show, Riverdale as the father of the lead character, Archie. Although a B-list actor who doesn’t have a lot of commercially successful films in his resumé, Luke has been able to maintain a consistent flow of work from film to the TV which has allowed him to build a net worth of $10 million. Luke was married to Rachael Minnie Sharp in the 90s. At the height of his career, he got married to Rachael in 1993 and the couple lived happily together until their differences drove them to a divorce in 2003. They have two children – Jack and Sophie with whom they both share joint custody. See Also: Luke Evans Bio, Net Worth, Is He Gay, Who Is The Boyfriend, Girlfriend, Wife? Ever since the divorce, however, Luke Perry hasn’t been in any high profile relationship and he’s currently believed to be single. His son, Jack Perry who was born in 1997 is a wrestler. His professional Wrestling name is Jungle Boy and he’s well supported by his father.